The Auschwitz concentration camp is actually made up of three camps - Auschwitz I, Auschwitz II-Birkenau and Auschwitz III. Together the complex forms the largest cemetery in the world, preserved as a sombre memorial to the victims of the Holocaust, and commemorating the hundreds of thousands of people exterminated there by the Nazis during the Second World War. The Auschwitz-Birkenau Museum was established in 1947 and visitors have access to both camps and can wander freely around the structures, ruins and gas chambers, and visit the exhibits displayed in the surviving prison blocks at Auschwitz I. The hushed atmosphere is one of shock from the moment visitors enter the barbed-wire compound through the iron gate, ironically inscribed with the words 'Arbeit Macht Frei' (Work Makes Free). The buildings contain displays of photographs and horrific piles of personal articles of the victims, including battered suitcases, and thousands of spectacles, hair and shoes collected from the bodies. The experience is vivid and disturbing, though also deeply humanising. There are general exhibitions dedicated to the Jews and their history, as well as an interesting documentary film screened in the museum's cinema. Birkenau sees far fewer tourists as it has fewer visitor facilities and much of the camp was destroyed by the retreating Nazis, but it is here that the sheer scale of the tragedy can be experienced, with a viewing platform to give some perspective over the vast fenced-in area stretching as far as the eye can see. Birkenau was the principal camp where the extermination of millions took place, a chillingly efficient set-up with rows of barracks and four colossal gas chambers and ovens. Purpose-built railway tracks lead through the huge gateway, terminating in the camp, with which victims were transported from the ghettos to the camp in crowded box-like carts, often being led straight into the gas chambers upon arrival. A trip to the Auschwitz Memorial Museum is a must for any visitor to Poland who wishes to experience some kind of sobering communion with one of the greatest atrocities in the history of the world. Taking a guided tour of the camps is the best way to fully comprehend what you are seeing and a tour takes at least three and a half hours. Visitors should try and book a place on one of the various guided tours at least two weeks before visiting - see the official website below for details. Address: WiÄ™Åºniów OÅ›wiÄ™cimia 20, 32-603 OÅ›wiÄ™cim, Poland. 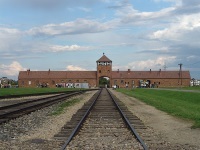 Transport: There are regular coach and rail services from Krakow (a one hour journey), and a shuttle bus runs between Auschwitz I and Birkenau from mid-April to October. Opening times: 8am to 3pm, Monday to Sunday.